Who spends an hour and 15 minutes in a hot car driving 62.15 miles for a donut? New England Bites - that's who! 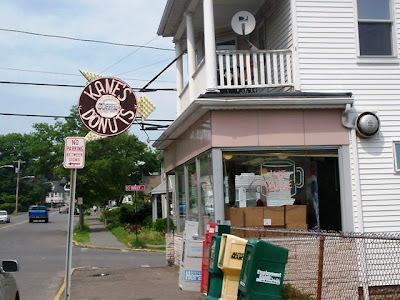 After busting out the new Tom Tom GPS system that my parents got me for graduation, Mom and I poured our melted bodies into my steamy ride and headed for Kane's Doughnut House in Saugus, MA. Are we insane? Maybe, but after reading so many wonderful things on the Internet about how good the donuts were, Mom and I were feeling jealous. With the Tom Tom right on target, we pulled up next to the building which had an old-fashioned neon sign that might have made Homer Simpson say, "Mmm ... donut." Peeling ourselves off the car seats, we headed into Kane's at just around 3 p.m.
Once inside we were automatically facing the large bakery counter. 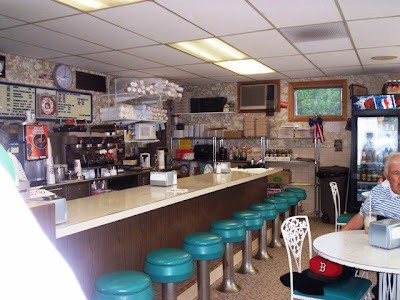 The rest of the small eatery was made into a diner which consisted of a large counter area and a few scattered tables and chairs. Hanging above me was a row of Kane's t-shirts, and on the back wall behind the counter was a donut clock with the Kane's logo for sale. So cute! I was trying to take it all in while Mom was pushing her way through the small crowd so that she could place her order with the friendly staff. 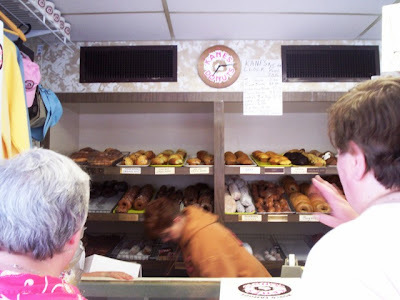 She ordered a box of mixed donuts, a Bismark, and one of their famous coffee rolls. The total came to $20.19 which is a lot for pastry, but with the wonderful Internet reviews still fresh in our minds, we were certain that the money spent, and the drive, would be justified. When we took the boxes back to my car, I took photos of the donuts in case the long ride home took its toll on their appearance. Before driving away for good, Mom and I ate the Bismark because a) it was made with real cream and would not have made it home, b) it came highly recommended, and c) we couldn't wait to try it. Once we took a bite - WOW! What a delicious pastry! 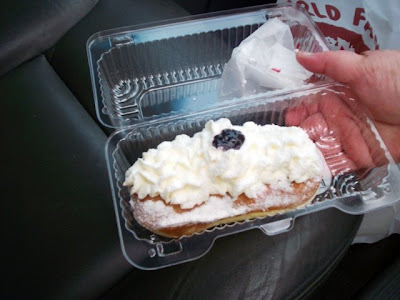 Both Mom and I thought that we'd never find a real cream donut that rivaled Butler's in Westport. Who knew it was in Saugus the whole time? The Bismark is a long, flaky donut with a stripe of jam (we think blackberry) inside, covered with real whipped cream, topped with a dollop of jam, and sprinkled with powered sugar. Surprisingly, it is not overly sweet. It was cool, creamy, and delicious. You could actually serve one of these for a dessert. They're that good. When we got home around 6 p.m., we still had more errands to run. Not wanting to leave the box of donuts and the coffee roll alone with my hungry father and sister, I grabbed a few ice mats, threw them into a cooler bag and placed the boxes inside. When we finally arrived home at 11 p.m. (yes, we had the donuts in the car for almost eight hours), Mom and I were nervous to see what shape our donuts were in. They were PERFECT. No bumps, bruises, melted icing, broken pieces, or lost filling. Kane's Doughnuts definitely traveled well ... but how did they taste? Dad was the first to try one of the donuts and he loved it. I was the second. I chose a chocolate glazed one from the box and took a bite - fantastic! It was so chocolaty and moist, not to mention humongous. It was almost like two Krispy Kreme donuts got together and formed a giant, tastier version. Mom had the honey glazed crueler which she found to be delicious. 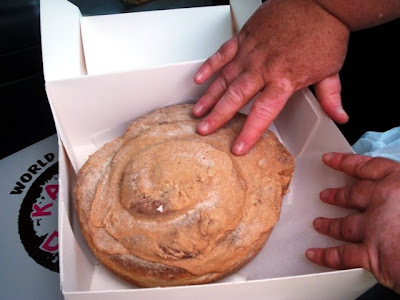 It was huge, had a slight crisp to the outside, and was very soft and cakey inside. She loved both the texture and the taste. 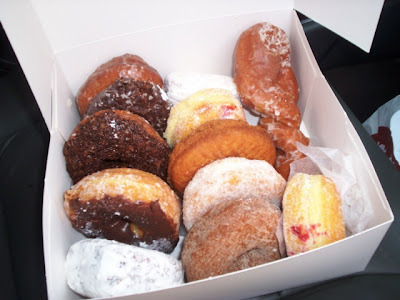 Other donuts in the box included a coconut with raspberry filling, a powdered sugar blueberry filled, an old-fashioned, a cinnamon, a jelly, a powdered jelly, a chocolate frosted with sprinkles, and a few others. Not included were the vanilla cream and the lemon filled which we had read so much about. Oh well, maybe next time. Now let me explain this coffee roll - the Big Foot of all coffee rolls. It is about the size of a personal pan pizza, and a mystery as to how Kane's gets it to stay so soft. It has just the right combination of cinnamon, cake, and icing. You can easily cut it up and feed about six people. Notice how tiny Mom's hand looks near the roll. Rumor has it that some men can eat a single one all on their own while washing it down with their morning coffee. Well, we may be pigs, but I don't think any of us could eat that by ourselves. I personally would be in a coma afterwards and would have to take a day off from work. However, the taste of the coffee roll was out of this world. We all cut a piece for ourselves and enjoyed the soft roll and its tasty icing. The World Wide Web may be filled with pervs, identity thieves, and x-rated sites, but without the Internet, Mom and I would never have known about the deliciousness that is Kane's Doughnut House. Sure, we'd probably be about 100 lbs. thinner, but then what would we blog about? Exercise? Yeah, right! Mom hasn't bent down in six years! Kane's Doughnuts may just be the best donuts that we've ever had, and they were definitely worth the drive and the price. These huge donuts are a must have for any New England bakery connoisseur, and we know you will not be disappointed. Kane's Doughnut House is open from 3:30 a.m. to 11 p.m. Monday through Friday, 3:30 a.m. to 5 p.m. on Saturday, and 3:30 a.m. to 1 p.m. on Sunday.